Rule 14-1b (Anchoring the Club) prohibits anchoring the club either “directly” or by use of an “anchor point” in making a stroke. The penalty is loss of hole in match play or two strokes in stroke play. Contrary to popular thinking this does not ban the Long Putter! 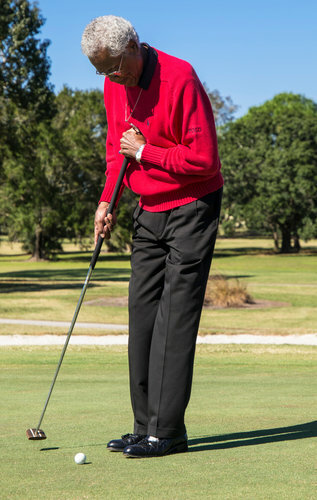 The long putter is still legal, but it can no longer be braced against the body. However it does make using the long putter more difficult to make a repeating consistent putting stroke. Golf is a traditional laden game that wants to stick to its’ roots. The crocket style (between the legs) putting style was banned many years ago mainly because it didn’t look like golf. I believe, if that had been allowed, almost everyone would be putting that way. It made aiming and stoking much easier than the standing to the side of the ball and looking sideways towards the hole. I think the new rule, to some degree, is aimed to make golfers look like golfers and play the game the old fashion way. I think Adam Scott looked ridiculous with his wide stance and very long putter that is anchored very high up just under chin. I am very glad that he appears to be putting well in the last couple of months with a shorter putter. I wish him continued success. Others are going to have a hard time. I have known Kevin Stadler since he was 15 years old. When he was a junior, he was a good ball striker and a terrible putter. He tried the long putter and instantly became a great player and solid putter. Jimmy Powell won 4 times on the Senior PGA Tour, but would have never gotten to that level of play without the long putter. Others on the PGA, LPGA, and European Tours have only used long putters their whole lives. They will be greatly affected and that is a shame, because rules officials are changing the rules in midstream. That said I like the new rule. The putting stroke should a free flowing athletic movement. I like golfers looking like golfers. With anchoring the long putter it makes for a less athletic movement. The USGA and the Royal and Ancient feel the putter should be swung freely, shaky hands or not, and because they determine the rules of the game they can dictate the intent for how the game was meant to be played. Agree or not, that will be the rule. Rule 14-1b will cost some professional golfers a lot of money and maybe a career. Some will still use the long putter, but will keep it away from their bodies. I can’t think that will work well. I only hope that Bernard Langer, Fred Couples, Webb Simpson, Tim Clark, Carl Pettersson, Colin Montgomery, Keegan Bradley and many more will find putters and strokes that will keep them playing and scoring well. For the recreational golfer, I wouldn’t change a thing. I would use your long putter the same way you always did and enjoy the game. The idea of golf is to have fun. The average golfer breaks so many rules in an average round of golf that I don’t see breaking one more as being that serious.